Unexpected afternoon rains washed the city of Bangalore clean of dust and grime on July 31, but also brought with it the usual after-rain-effect - traffic jams. 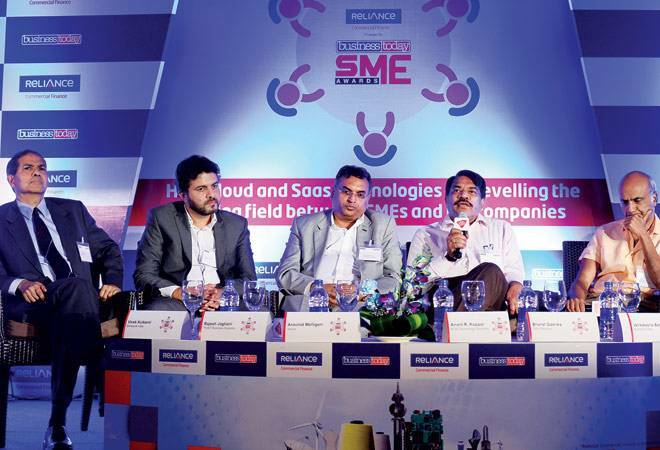 Yet, people flocked to hotel Vivanta by Taj in Whitefield, the IT hub situated in Bangalore's eastern fringe, to participate in a fascinating roundtable discussion organised by Business Today, on how Cloud and SaaS technologies are levelling the playing field between SMEs and big companies. In a world where technology is finally allowing the small fry to play with the big boys on almost equal terms, this was certainly an apt topic. And the line-up of panellists BT had put together was also the most appropriate. Leading the way was Bharat Goenka, Cofounder and Managing Director of Tally Solutions, the maker of the eponymous accounting software that is almost ubiquitous in small companies. Then there was Anant R. Koppar, a serial entrepreneur who founded Kshema Technologies earlier, and is now Chairman and CEO of KTwo Technology Solutions, a healthcare solutions provider. Bringing in a unique perspective was Aravind Melligeri, Chairman and CEO of Aequs, which provides precision machining, sheet metal fabrication and other services to companies like Airbus, UTAS, Eaton, Bosch, etc. Rajesh Jagtiani, CEO of Think7, brought in a two-dimensional aspect through running a company that makes software for auto manufacturers, and also having an auto components company owned by the family. And bringing up the rear was Vivek Kulkarni, former IT & Biotechnology Secretary of Karnataka, who founded Brickwork Ratings, an SME ratings company. The panel was moderated by Venkatesha Babu, BT's Deputy Editor. The discussion started with Goenka making clear that he didn't believe moving applications from desktop to cloud would help. "In the long run, it is going to add cost," he said. "It is about whether you can create connected applications. How can SMEs connect to each other, connect to the supplier, customers, lending sources, to banks for transactions and payments? So, connectivity will become the most important leveller." He added that some of those levelling advantages will reside in the cloud, some in offices, and some in devices. Disagreeing with him was Melligeri, who started with an example of how he started with Quest Engineering, a company he founded earlier. "The first day we spent $45,000 to buy software, and $20,000 for an SGI computer," he said. "Today you don't need to own such powerful computers. It will probably be on Amazon (cloud services)." Melligeri's argument was that as SMEs try to go global, cloud-based SaaS (software as a service) applications will take away the geographic barriers and enable them to compete globally with big companies. Brickwork's Kulkarni, too, was in favour of cloud and SaaS technologies. His argument was that earlier people would pay Rs 32,000 for a desktop and Rs 18,000 for software. But such software would be loaded with features, most of which would not be used. Plus, the software would be upgraded, so companies had to upgrade their systems and pay again. "Right now, this is all available on the cloud," he said. Kulkarni added that companies can use cloud services on data centres that are the size of football fields in America, and used the example of lodging rental company Airbnb, which uses Amazon's data centres, as an example to drive home his point. Think7's Jagtiani started by saying that India itself is not a level playing field, and referred to a report that said just about 260 companies among 20,000 surveyed had more than 60 per cent of the profits. "When we started Think7, we realised it's not about cloud or not. Today, it's more about trust in business," he said, adding that the timing for cloud technologies is perfect for India. More than 90 per cent of Think7's customers are on the cloud, and they are all SMEs. KTwo's Koppar proffered views from the IT solutions providers' angle, saying that providers need to understand that these technologies were there 30 years ago as well, and that cloud is only a new name. He agreed that for the provider, cloud and SaaS have given a level playing field. "I can put up a solution on the cloud and ask clients to use it," he said. "Ten years ago, we did not have this level playing field." At the same time, he warned that the tag of affordability with cloud solutions might not last forever. "At this point, cloud may be cheap; later it may become expensive. So, it is better to go with your own systems and software." Security on the cloud was another issue that was hotly debated. Jagtiani said security was well taken care of by companies like Amazon and Microsoft, while Kulkarni pointed out several instances of data residing in cloud having been hacked and private data accessed by unauthorised and unscrupulous people. The evening ended with an engaging Q&A session between the audience and the panellists, which took the discussion beyond the stipulated time. By that time, the skies had also cleared up and a cool wind replaced the muggy conditions in the city. The roundtable was sponsored by Reliance Commercial Finance, which is also the sponsor of the BT Best SMEs Awards. Reliance Commercial Finance is presented by Reliance Capital Ltd.